This book critiques the decision-making process in Article 53(a) of the European Patent Convention. To date, such decisions have been taken at high levels of expertise without much public involvement. The book eschews traditional solutions, such as those found within legislative,... read full description below. 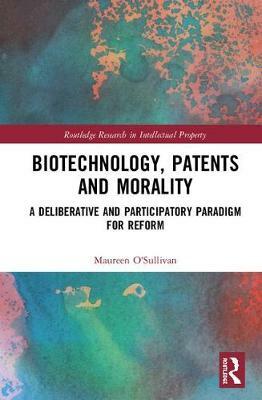 Maureen O'Sullivan, BA, BCL, LLM, PhD. Lecturer (Above the Bar) in Law, National University of Ireland, Galway. Chair, Vegetarian Society of Ireland. Fellow, Oxford Centre for Animal Ethics.